I’m currently in Scotland with my mother – a trip that I planned as a gift for her 70th birthday. How did I sneak a pilgrimage to the home of Hogwarts and the book capital of the world (Edinburgh) past my non-reading mother?? Well, there are ancestral ties, and history, and lots of mountains, lochs, and sea to hike, swim, and kayak in (maybe)(if we’re brave enough!). 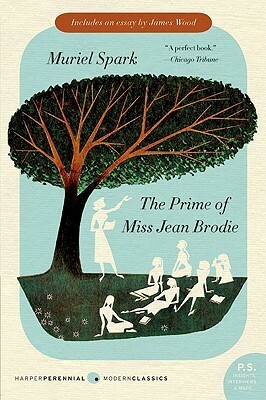 In preparation for our trip, I read a few books by Scottish authors, and my favorite by far was Muriel Spark’s The Prime of Miss Jean Brodie. At the staid Marcia Blaine School for Girls in Edinburgh, Scotland, teacher extraordinaire Miss Jean Brodie is unmistakably, and outspokenly, in her prime. She is passionate in the application of her unorthodox teaching methods and strives to bring out the best in each one of her students. Determined to instill in them independence, passion, and ambition, Miss Brodie advises them, "Safety does not come first. Goodness, Truth, and Beauty come first. Follow me." And they do—but one of them will betray her. Unconventional schoolteacher Jean Brodie is in her prime, and the group of girls she selects as her set is destined… for what, they do not yet know. But Miss Brodie has assured them she will mold them into the crème de la crème. The school years of the Brodie set form the background of a comedic, incisive, and thoroughly enjoyable coming-of-age novel – one that never falters in excellence or execution. At first I thought (as maybe you are thinking now), after reading that description: What is there in this book about a group of girls and their schoolteacher that is so universal, that has won so much acclaim? Also it’s a short book… what can be so enchanting about it? But by chapter two I was a convert. It’s delightfully, perfectly succinct, and it doesn’t need another word added to it at all. What first caught my attention was the careful unspooling of the personalities of each of the girls in the set, measured by the chronological storyline, but also enhanced by semi-frequent flashbacks and flash-forwards (mostly the flash-forwards). As a reader you are figuring out a central mystery (the betrayal of Miss Brodie! *gasp*) as you go, and Spark leaves a breadcrumb trail that employs repetition, economy, and small twists to outstanding effect. Here’s how my reading experience went: I knew I was reading a Great Book, but I still spluttered with laughter and raised my eyebrows and thought to myself, “this is FUN” at regular junctures. And mixed in with the absurd and hilarious, there was commentary about classism, religion, and morality – nothing heavy-handed, but threads to tease out and provide context to the world of the novel, the world of 1930s Edinburgh. I ended my reading happy and refreshed, but also with the wish that this title had been paired with Jane Eyre in my school days – it might have shaken me out of my pious seriousness a bit, and given me some perspective for the stack of Great English Novels I was steadily working my way through. There’s no doubt that The Prime of Miss Jean Brodie is brilliant – it is simply so in a sharply edited, comedic sort of way. The Prime of Miss Jean Brodie is beyond my powers of description. I adored it. Recommended for. fans of classic literature, novels, literary fiction, historical fiction, novellas, and coming-of-age fiction. Or really anyone ages 14 and up. Goodness, truth, beauty - three things that help us to know God. Have not read the book, but am intrigued. I read this so many years ago and got rid of my copy at some point but now I wish I hadn't because you've made me want to reread it! Well ... yay, libraries!